Hand-blended to a traditional Moroccan recipe, this refreshing green tea is a perfect blend of gently-rolled olive green leaves - a punchy and sweet Gunpowder Green tea and a great-taste award winning Nana mint (spearmint) producing a clear, yellow-green cup. 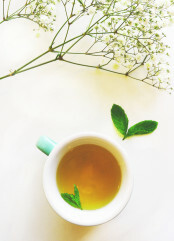 Combining the gunpowder green tea and spearmint leaves together creates a delicious, aromatic tea with health benefits. 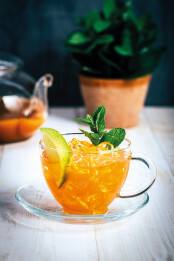 Searching for your perfect Moroccan Mint tea recipe, well look no further! Just brew up a cup of this aromatic blend, add a heaped teaspoon or sugar, a sprig of fresh mint & enjoy! Product : This is my favourite. Lovely fresh tasting tea. I was disappointed that I couldn't set up an account with the on-line store for Suki Teahouse limited. For some reason my email address was identified as being possible SPAM. I wrote to Suki Teahouse via email but I never received a reply. Service rating : I would buy again very good service, and fast delivery. The package was very good and so was the tea. Product : I love mixing this tea with the chamomile it give it a nice refreshing taste. Service rating : It's effortless to order. The tea is excellent. And it reaches me quite quickly. And prices and freight cost is good. What more can I wish? Product : I found Suki green tea Mint, in London once. So I tracked down where I could buy it again. Service rating : My order for tea was dispatched in a timely manner. Apples loves mint smells and tastes fantastic. The Belfast brew also lives up to the accolades its a great cuppa. I was however disappointing by the Peppermint. I have ordered this a few times now its a favorite. The contents smell was... Service rating : My order for tea was dispatched in a timely manner. Apples loves mint smells and tastes fantastic. The Belfast brew also lives up to the accolades its a great cuppa. I was however disappointing by the Peppermint. I have ordered this a few times now its a favorite. The contents smell was not as fresh and the tea also very bland. I did send an email via the web interface however I have not received feedback a bit disappointing. Product : Becoming one of my favorites. Trying to drop the coffee using this as an alternative. Product : One of our newer blends - a brilliant blend and great any time of the day!